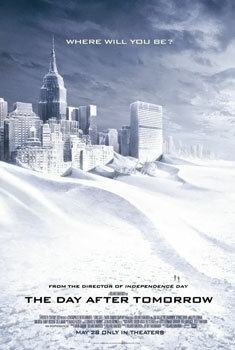 I guess that for most of you the title of this post resembles that famous film titled ‘The day after tomorrow’. It’s not a coincidence that I have chosen this titled to talk you about some of the Myths and Legends related with one of the most well-known process affecting our climate. That is the concept of Thermohaline Circulation, maybe also known by some of you as the Meridional Overturning Circulation. In the failure, collapse, halt of that circulation, the argument of this film is based on. I should watch the film again, because that is basically all I remember about it. I don’t write this post to criticize the film; I want to leave that clear. And without more delay, I start because otherwise writing the post in Spanish and English finally takes me three days (It took me more at the end. Sorry for the delay in the English version ). As a consequence of antropogenic greenhouse emissions, oceanographic models predicted a decrease in the Thermohaline Circulation and Meridional Overturning Circulation circulation (Velinga and Mood, 2002; IPCC, 2007) associated to a reduction of the deep water formation, especially in the North Atlantic. 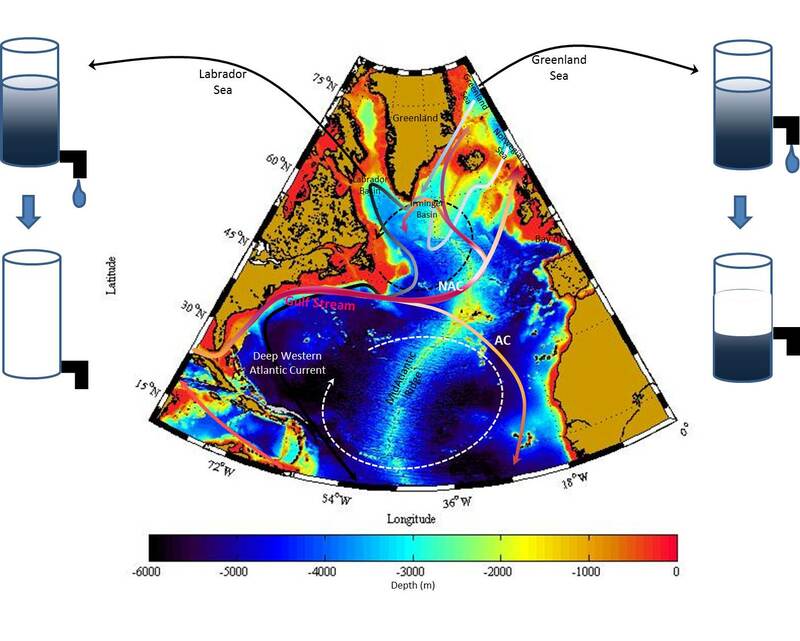 The Achilles' heel of this sequence of events was the stop of the process known as ‘deep convection’, responsible for the deep water formation in the Labrador and Greenland Seas in the North Atlantic. Although perhaps only known because of the film, I guess these ideas are not completely strange for you. However, in the last decade, some of these ideas have begun to be questioned. Why? One of the most notorious reasons is that in the Greenland Sea, one of the places that are normally associated with this process (later I will explain why I underline this sentence), there is no deep water formation since three decades ago. Fortunately, the collapse of Thermohaline Circulation predicted by ocean models has not taken place. Whew! Then, however, you will probably wonder how that can be. Is there something wrong with the concept of the Thermohaline Circulation and Meridional Overturning Circulation, and that I represent schematically in the figure below? Or in other words, is there something wrong in the sequence: (1) at high latitudes due to very low air temperatures surface waters cool and become denser sinking in the water column and resulting in the formation of deep water; (2) those waters flow to lower latitudes (equatorial) through the ocean bottom; and (4) the deep waters formed at high latitudes are replaced by warmer water flowing at the surface from lower latitudes while (3) the bottom water returns to the ocean surface? Well, yes and no. - The water flowing at depth (2) (derived from deep water formation (1)) must be in balance with the water flowing at the surface from low-latitudes (4). - Since the deep water must return to the surface (3), the balance of water circulating at depth (2) and at surface (4) depends on the deep water return to the surface (3) and not in deep water formation (1). In general, transports (how big are the arrows in our scheme) of deep water towards low-latitudes (2) or of warm surface water towards high-latitudes (4) determine the intensity of the Thermohaline Circulation or Meridional Overturning Circulation, respectively. At the end, such intensity controls how much heat is exchanged from equatorial and subtropical to subpolar zones, and vice versa, to regulate our climate. 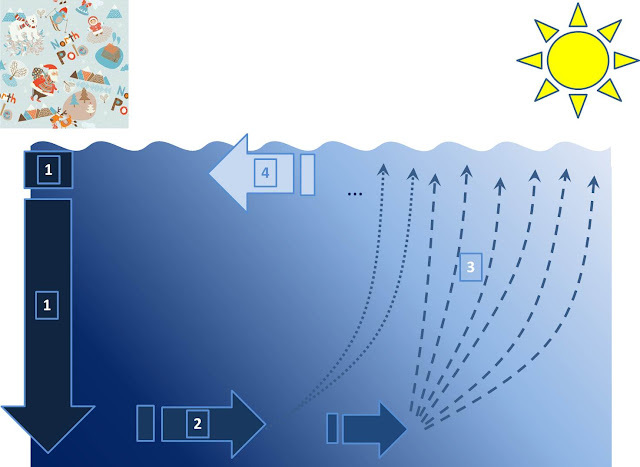 An important difference between the two interpretations of ours scheme is that the latter depends on a process that occurs throughout the ocean, deep water return to the surface (3), while the former depends on the cooling conditions in a specific place, which result in the formation of deep water (1). Presented in a simplified way, this is the conclusion that Walter H. Munk and Carl Wunsch got in their work 'Abyssal recipes II: Energetics of tidal and wind mixing' (1998) after a review of the previous work 'Abyssal recipes' of Walter H. Munk (1966): the intensity of the Meridional Overturning Circulation is primarily determined by the power available to return deep water back to the surface layers, and that comes from the wind and tides, and not by cooling conditions responsible for deep water formation at high latitudes. For those of you not scared by an oceanographic research article including formulas, I recommend their reading. I really enjoy them. Thus, our Thermohaline Circulation and Meridional Overturning Circulation don’t depend on "local processes" that are subject to larger variability, but on larger-scale processes and therefore more stable. Another ‘little big detail’ among the reasons why the halt of deep water formation in the Greenland Sea has not led to a collapse of the Thermohaline Circulation is that although there is (was) deep water formation in the Greenland Sea, the resulting deep waters are too dense to cross the different ridges that would enable it flowing towards low latitudes (see Figure 3). Returning to our previous scheme (Fig. 2), it means that we can have (1) in the Greenland Sea, but it doesn’t contribute to (2), and so either to (3) or (4), not affecting the Thermohaline Circulation and Meridional Overturning Circulation. For this reason, at the beginning, I emphasized the fact that Greenland Sea is one of the places that are usually associated to this circulation, but that is not an accurate representation of reality. It doesn’t mean that what happens in the Greenland Sea is not important; in fact, this basin plays a crucial role in our climate but not for its contribution to the Thermohaline Circulation. Map of the North Atlantic where you find the Labrador Sea and the Greenland Sea at its northern limits. As you can see by the color bar at the bottom, the depth of the Labrador Sea is about 4000 m. communicating directly with the remaining deep North Atlantic. However, although the Greenland Sea is about 3600 m. depth, it is surrounded by ridges (orange colors in the surroundings of the Greenland Sea) rising to 1500 m. below the sea surface. This means that if we imagine that these two seas are two glasses of water, the deep water formed in the Labrador Sea can leave the glass through a tap at the bottom, and so deep waters can flow to the rest of the North Atlantic. However, the deep water formed in the Greenland Sea can only leave the basin (the glass) through a tap located just above the ridges surrounding it (there is no other possible exit), and hence the densest waters generated by deep water formation in Greenland Sea can’t flow to the rest of the North Atlantic. Altogether explains why even when there is no deep water formation in some areas of the North Atlantic as the Greenland Sea since the mid-80s, the Thermohaline Circulation hasn’t stopped and we haven’t suffered a cataclysm. Part of what I have told here is included in the article that I saw you the other day on Facebook but not published yet. Thus, if anyone wants to use this information I would be grateful if you get in contact with me to cite it properly.